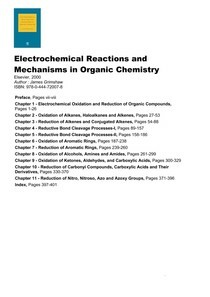 tions because the outcome from electrochemistry was often far from predictable. of the former pitfalls can be avoided. oxidation step at the anode nmst be accompanied by a reduction at the cathode. During an oxidation, whatever is evolved at the cathode is m effect a spent reagent. nitrile from acrylonitrile led to a resurgence of interest in organic electrochemistry. Alternative electrolytes are now readily available. ing this book has caused.